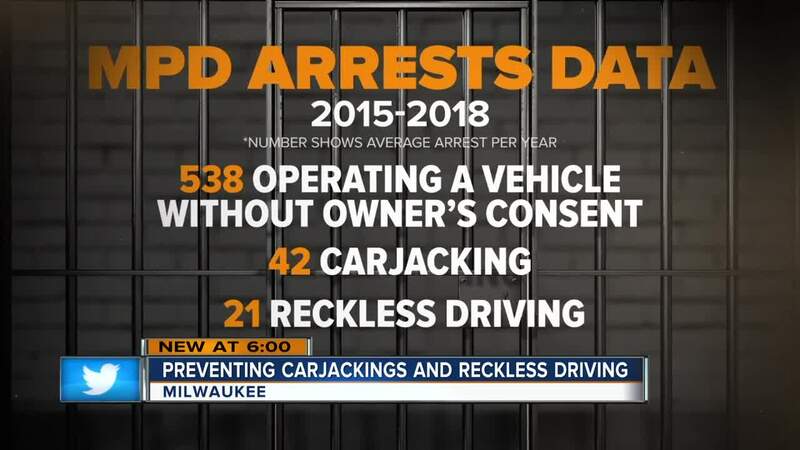 Milwaukee officials are bracing for new data on reckless driving and carjacking in the city. Additional 2018 numbers are expected later this week and are believed to be higher than previous years. Recent police car chases are examples of what Monday’s task force meeting hopes to prevent. Looking for new ways to curb dangerous behaviors behind the wheel. Reckless driving has been a growing concern in Milwaukee. That’s why the Carjacking And Reckless Driving Task Force met Monday morning to talk about the city’s concerns. Alderman Michael Murphy is the committee’s chairperson. Cacy Masters with Safe and Sound, was part of that meeting as well. “Safe and sound works for public safety and one of those things is keeping our street safe for the residents,” Masters said. This meeting comes just days after the death of 25-year-old Pedro Colon-Ortiz. Ortiz was killed when an alleged reckless driver fled from a sheriff’s deputy, ran a red light and hit Ortiz’s car. “This loss of life last week examples from Mr. Ortiz it seems like that’s a daily occurrence right now and looking at changing behavior is the critical component,” Ald. Murphy said. Last year. three laws went into effect with stiffer punishment for offenders, but city leaders say more needs to be done. “We will be targeting this through enforcement and education and prevention,“ Ald. Murphy said. Police averaged 538 arrests for operating a vehicle without owner’s consent between 2015 and 2018. They also averaged 42 carjacking arrests and 21 reckless driving arrests each year over the same period of time. Most of the offenders are between 17 to 21 years of age. Safe and Sound offers educational programs for young people to encourage safe behavior. Masters hopes that with city input, the reckless driving concerns of the city can be met. “If we could do it in a way with the cities involved with their other partners involved along with safe and sound in residence and you i think we can really tackle this issue,” Masters said. Ald. Murphy agrees and hopes the task force can help bridge gaps between the city, community organizations and officers as they all work together with a common goal.